TOP SCULPTURES LTD is a specialized company that produces and sells stone carving, Virgin Mary Statue, Jesus Sculptures, David statue, Mary with baby and lamb statue, marble carving, sculpture, stone statue, marble statue, marble fireplace, marble fountain, marble column, marble bust, marble flowerpot, marble gazebo, garden table and chair, stone animal, stone basin, stone bathtub, stone mosaic, imitation antique sculpture, granite tombstone, granite countertop, granite water fountain, granite rolling sphere fountain, granite bathroom wash basin, granite Vanity Tops, granite fire pit tops, granite stair steps, granite statue, granite sculptures, cobble stone, paving stone, stone gate post, acceptable projects. In the past years, we have gained a very good reputation in the whole country, and we are even quite famous abroad. Our marble statue products has our own manufactory, located in Quyang County, known as "Home of Sculpture", which covers an area of 60,000 square meters. We employ more than 600 staff. We adopt refined shape design to the products with the consummate craft, making you savor Europe classical romantic style and return to natural warmth. Competitive power of our resources: Abundant stone resources and many kinds of stones, such as marble granite limestone travertine slate quartzite sandstone and imported stones. The marble products and granite slates are from our own quarries and fabricated by our own stone processing plants, therefore continuity of the best quality and lowest cost are ensured. 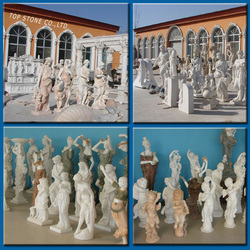 Both the natural stale and pure white marble for carving are just from QUYANG town. The pure black granite most suitable for monument is also from the adjacent region. Above all,our products are of better quality and lower cost comparing with similar products from the other parts of the world. Craftsmanship and technological advantage: All of our stone plants are manpowered by craftsmen and skilled technicians from the home of China's sculpture. Our designers and workers are familiar with the artistic style of both East and West. Logistic and services: As dedicating to international cooperation and marketing the Chinese products worldwide, TOP SCULPTURES has established a complete service system that is in a position to meet the requirements of different clients. We are now building our overseas distribution network by relying on experienced sales professionals, simple & speedy ordering system and logistic center, to provide more humanized services to our global clients. 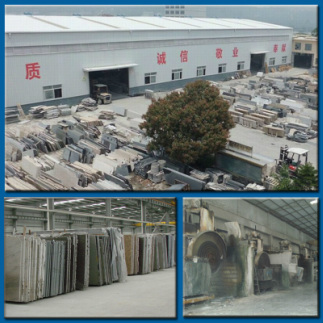 Our granite products factory is located in the Chinese Stone Center-Shuitou Town, founded in 2002. Our company is a full service provider of granite, marble, quartz and engineered stone countertops, bar tops, vanity tops, fireplace surrounds, tub surrounds and floorings for commercial projects. With unmatched stone materials and outstanding fabrication, our company has quickly developed into an integrated stone enterprise of quarrying, processing and sales.